Oregon quarterbacks do not have the best track record when it comes to production at the NFL level. 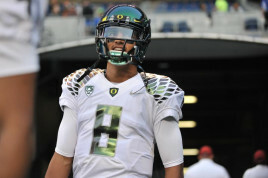 Since 1999 and prior to Marcus Mariota, Oregon had five quarterbacks taken in the NFL Draft, two of which were 1st-round picks – Akili Smith and Joey Harrington — two in the 5th round – Dennis Dixon and A.J. Feely — and Kellen Clemens, who was taken in the 2nd round. Joey Harrington: Selected 3rd overall in the 2002 NFL Draft with a career win-loss record of 26-50. Akili Smith: Selected 3rd overall in the 1999 NFL Draft with a career win-loss record of 3-14. Dennis Dixon: Selected 156th overall in the 5th round of the 2008 NFL Draft with a career win-loss record of 2-1. A.J. Feely: Selected 155th overall in the 5th round of the 2001 NFL Draft with a career win-loss record of 8-10. Kellen Clemens: Selected 49th overall in the 2nd round of the 2006 NFL Draft with a career win-loss record 8-13. 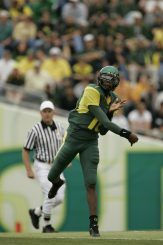 Dennis Dixon launching a pass downfield in 2004. As you can see, most of those quarterbacks did not perform so well at the NFL level with a combined record of 47-88, with Dixon being the lone QB to post a winning record as a starter. Those stats do not bode well for the Ducks, especially when it comes to recruiting top-notch talent at the quarterback position. The best high school quarterbacks in the nation often have NFL aspirations, and that affects where they choose to play their college ball because certain colleges have higher levels of pro potential based on the types of offenses they run. We can look to the most recent NFL Draft to see the effect in action, Jameis Winston and Mariota were both elite talents coming out of college, but Winston attended Florida St., which runs a traditional pro-style offense, while Mariota attended the U of O, which runs a version of the spread offense and what analysts around the nation call a “gimmick” offense that does not prepare quarterbacks for the NFL. That was and still is the major blemish on Mariota — he never played in a traditional offense — and that he doesn’t know how to lead the huddle, call plays or make the 3-, 5-, and 7-step drops. But this stigma on college QBs coming from a spread system exists for a reason, because often it is true. There were cases of quarterbacks lighting it up in college with the spread offense, only to hit a developmental wall in the NFL. So, for the sake of the Ducks football future with recruiting pitches to the top quarterback prospects in the nation, Mariota needs to break through that wall. 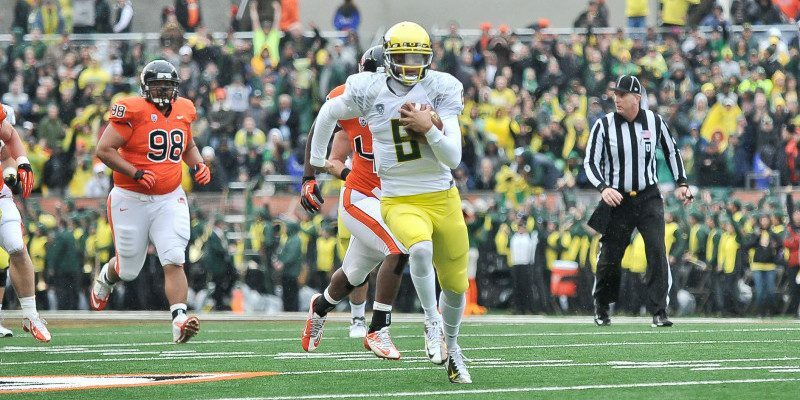 If Mariota’s skills do not transition well to the next level, what does that tell future recruits about Oregon? It tells them that you can break records and win a bunch of trophies, only to flame out where it matters most — in the NFL. Marcus Mariota taking the field as the Ducks face off against Washington State. Obviously, the Ducks have done fairly well for themselves without the help of a 5-star QB recruit, but with the post-Mariota era upon us, it wouldn’t hurt to pick-up a top quarterback recruit every couple of years — just in case Coach Mark Helfrich does not stumble upon another Heisman Trophy-caliber quarterback. Thankfully, Marcus Mariota is the best of us — the most talented player to ever don a brightly colored Oregon Duck jersey. He has all of the tools to succeed at the next level, and if the major blemish against him is merely his transition to a pro-style offense, then I’ll bet on him every time.